Alrighty, this took… a bit longer than expected. x_x And I don’t even have animations to show just yet! The ones I’ve put up in the past actually take me a good 30 minutes each to play with, so it’s a little difficult to find the time now even though that’s certainly better for presentation purposes. I’ll have her on Monday for sure. 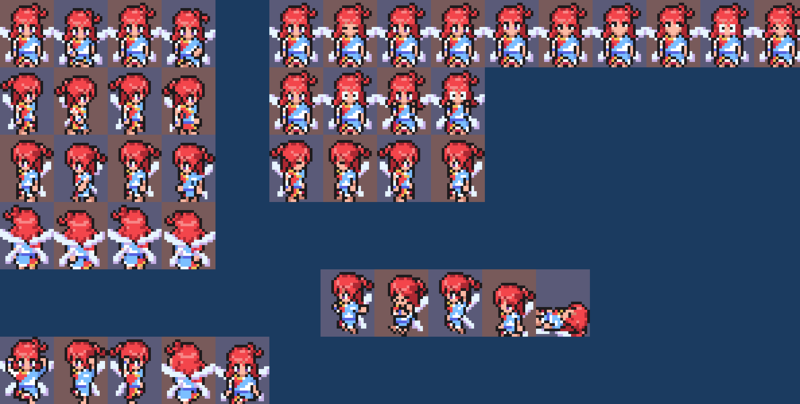 What I do have to share are some extra sprites for the tilesets from Becca! Much like when I was testing the EarthBound-style HP counters a few months back, I haven’t been able to make the multi-turns battle system feel quite as intuitive as I’d like for what I’m aiming to do. It basically degenerates battles into a lot of micromanaging and tracking turn numbers, which is something I occasionally enjoy in games like the Etrian Odyssey series, but doesn’t even slightly fit the lighthearted universe and old-school feel of Dreamblazers. Great system, but in the end I can’t go with it. After all the previous time spent figuring out what to do with fashion bonuses, I’ve settled on making enemies stronger overall and making fashion bonuses slightly tougher to obtain. Stronger enemies was an easy call, but fashion bonuses not so much. My main issue in the current setup was that just in my imagination alone it seemed really weird to me what kind of results I was getting. Right now you could put double nail polish in her two empty accessory slots and a pair of transparent stockings on her legs and she’d immediately earn a Girly Girl bonus. Note that I said transparent stockings, so basically nothing about her design changes in this hypothetical except the color of her nails. While this works from a standpoint of internally-consistent logic—her hat grants 1 Girly Girl point, each set of nail polish grants 1 Girly Girl point, and stockings grant 1 Girly Girl point, so she hits the required 4—it doesn’t feel right, at least not to me. It doesn’t feel earned. Right now you could put a headband on her, put a martial arts belt on her, swap her bracelets out for sweat bands, and swap her boots for sneakers and she’d qualify for a Sporty bonus. Again, this doesn’t feel quite right. …her hair pieces could give 2 Girly Girl points, her dress could give 4, her bracelets could give 1, her sash could give 3, and her boots could give 2. Or at least that’s the current idea! Giving different levels of importance to different pieces of clothing makes the distribution feel more believable from an in-universe perspective instead of pure number manipulation. Welp, here’s the big one. A month and a half ago I finally got around to upgrading to Unity 5, but now my various plugins are pushing me into upgrading to Unity 5.1 sooner than later. I haven’t done it yet, but I’m dreading this one, to say the least. The previous upgrade already set me back weeks and the specific reason I have to upgrade is because of some old features being updated or removed, so I just know it’s going to happen again. Mind you, I don’t want to overstate my frustrations: of course I know that it would take me probably six years of saving money to afford a programmer and make Dreamblazers “the hard way” rather than using Unity, so it’s still by far the ideal solution for me, but nonetheless there’s still always a slight loss of control when it comes to building a game on frequently-updated third-party software. You can never quite know when your flow is going to be broken and you’ll be sent on a wild detour. All that said, ultimately updates are always for the best because of the new features they offer me, whether native to Unity or found in third-party assets, so this is also a time of looking forward with the future in mind. This entry was posted in Dreamblazers on June 29, 2015 by JellyPaladin.